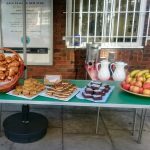 On Wednesday 13th June, our annual cyclists’ breakfast was held outside the Somers Town Community café (NATA28) in Ossulston Street. On 15th June 2016 at Somerstown Community Cafe, Ossulston Street. Now in its nineteenth year! 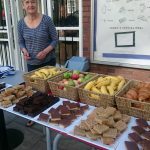 On 17th June 2015 at Somerstown Community Cafe, Ossulston Street. Now in its eighteenth year! 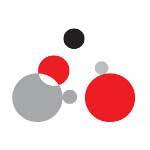 On 18th June 2014 at Somerstown Community Cafe, Ossulston Street. Now in its seventeenth year! 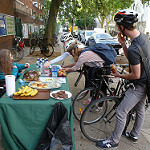 (in its 14th year) Our free cyclists breakfast and Dr Bike took place on Wednesday 22nd June in at our usual spot on LCN route 6 in Ossulston Street at the junction with Brill Place. 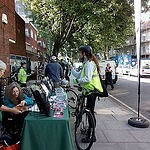 In Ossulton Street, at the junction with Brill Street– many cyclists called in for free snacks, maps, a bike check and a chat.